Search Results for "mixed couple home"
Young mixed race couple sitting on the floor of new home they just moved in. They using laptop for planning. Attractive mixed race couple lying on the floor among unpacked boxes in their new home they just moved in. Talking about future and smiling. Positive mixed race woman with paintbrush standing on stepladder and man with paint roller painting interior wall while diy couple renovating new house. Couple making home improvement and makeover. 4K Mixed ethnicity couple in new home, man makes a phone call while his partner paints a wall. Shot on RED Epic. 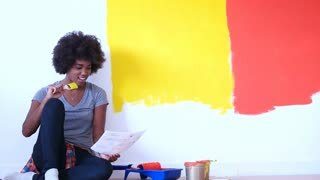 4K Happy mixed ethnicity couple in new home, woman makes a phone call while her partner paints a wall. Shot on RED Epic. 4K Happy mixed ethnicity couple in new home, woman gets good news from a phone call while her partner paints a wall. Shot on RED Epic. 4K Mixed ethnicity couple in new home, woman does the accounts while her partner paints a wall. Shot on RED Epic. 4k, Young mixed race couple moving into their new home. Slow motion. 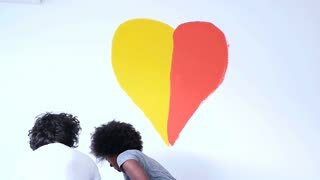 4K Happy attractive mixed ethnicity couple painting a wall in new home. Shot on RED Epic.